We are members of the Baker Ross Bloggers Network, and every few months we are lucky enough to receive a big box of seasonal crafting materials. 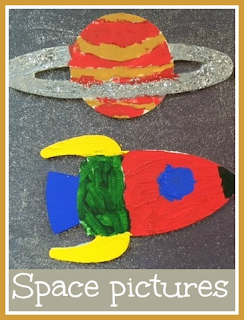 This time we received lots of summer crafts, and we are still busy working our way through them, so I'll be sharing some of our creations in a post next week. But also in the box this time was a bag of wooden space shapes, and we had such fun decorating them that I thought they deserved their own post. Sometimes I'm at a bit of a loss when presented with blank shapes to decorate as I don't really know where to start. Until now the children have needed quite a lot of guidance and help from me. But I showed Harry some examples from the website, and explained to him how he might like to use a pencil to mark out his design in advance before we painted. Then I treated him to some of my acrylic paints to decorate them with, and he loved the opportunity to use some 'grown up' art materials. He came up with some lovely designs, and while he was doing it I painted a star and moon shape yellow for Mia to decorate when she was back from nursery. I helped her to use glitter and sequins to decorate the shapes, thinking that would be enough for her, but of course she wanted a go with the paints too, and decorated a couple of her own shapes. The wooden shapes are glued to a piece of black card which has been mounted on a piece of thicker cardboard and then painted with silver glitter paint. I really like them, they are so lovely and I was so impressed with how well the children worked with just a little bit of help and input from me. They are definitely going to be displayed proudly! We received the wooden shapes in our Baker Ross crafting box.